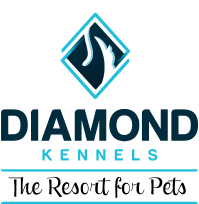 Diamond Kennels provides a healthy, fun and relaxing home away from home for pets. We understand and respect that your pets are treasured members of your family, and we take very seriously the responsibility of caring for them. You can blame us if your pet wants to stay! Whether your pet stays in our huge luxury villas, our uptown suites, or standard rooms, all of our lodging areas are sparkling clean and climate-controlled. Lots of skylights and windows, beautiful décor, and soothing music played 24/7 throughout the building all create a calm environment that helps to reduce the stress of being away from home. Your pet must have current vaccinations. For Dogs: (Bordetella, Distemper, Rabies and starting March 2019, Canine Influenza. For Cats: Distemper and Rabies. Your pet must have a friendly temperament, and be in good health and parasite-free. You will need to provide us with your pet's proof of vaccination and the easiest way to do that is to ask your veterinarian to fax the document to us. You can fax or email the information as well, as long as it is on official stationery from a licensed veterinarian. Unfortunately, we cannot accept handwritten info from breeders, and we also do not accept vaccinations that have been purchased and given by owners. For more detailed information about requirements and restrictions, especially for puppies and kittens, please refer to our POLICIES & FAQs section. We are open Monday-Saturday from 9am-12pm and 4pm-7pm. We're open Sundays from 4pm-7pm. You may check in or check out any time during our open hours. We bill each stay like a hotel. You pay for the day you drop off your pet regardless of the time. If you pick up your pet between the hours of 9am-12pm (except on Sundays), then you are not charged for that day; however, if you pick up between 4pm and 7pm, then that day is added to your bill. Morning pick up is not available on Sundays so there is an automatic charge for that day. Keeping your pet happy and healthy is very important to us! If your pet needs medication during their stay, please make sure to bring the container that the medication was dispensed in (whether it's prescription or over-the-counter) so we know the name, dosage and milligrams of what we are giving in case there is an emergency and we could not get in touch with your vet. Also, it is a good idea to bring enough medication for an extra day or two in case you cannot get back on your scheduled departure date. If you give your pet medication in a special treat or food, please provide that so we can keep your pet on a familiar routine. There is a nominal charge per day for medication (prescription or OTC). We do not give injections of any kind, and we suggest you contact your vet to discuss the best option for boarding for your pet that needs injectables. Meet Rico, our Pet of the Moment! Chris and his wife adopted Rico from www.littlenuggetsrescue.com in May of 2014 who had originally rescued him from the streets of Douglasville, GA. When the rescue facility first started working with Rico, he was only 40 lbs and resembled a walking skeleton. After a year of care, Chris came along and decided to adopt Rico, who at the time was still undergoing treatment for heart worms. The facility agreed to let Chris take Rico as long as he would continue to administer medication and take him for regular vet checkups at the facility’s expense. Chris gladly accepted and brought Rico to his new home. Since then, Rico has become quite the traveler with trips to Florida and Tennessee. He loves to play with squeaker toys, go for morning runs with Chris and spends much of his time lounging on the couch watching birds come to the bird feeder. He’s brought great joy to Chris and his wife and we were blessed to be able to care for him for a short time at our boarding facility. Thank you to Chris and his wife for sharing Rico and his story with us.